An instant classic. And this recipe is so easy to make. What a fantastic dinner idea. 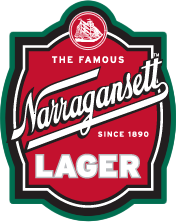 Perfect with a cold Narragansett, the official beer of the clam. Pasta, clams, ‘Gansett? Yes, please! Bring a large pot of water to a boil. Add salt and the linguini and cook to an extra chewy al dente, 7 minutes or so. The linguini will continue to cook in sauce, later. To a large skillet heated over medium heat, add oil, anchovies, garlic, thyme and red pepper flakes. Cook together until anchovies melt into oil and break up completely. Add wine to the pan and give the pan a shake. Add clams and their juice. Drain pasta and add it to the clam sauce. 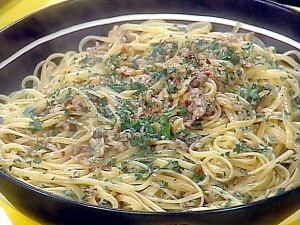 Toss and coat the pasta in sauce with clams until the pasta absorbs the flavor and juices, 2 to 3 minutes. Remove from heat and season with salt, add parsley and serve.